A full house comprising of fishworkers from coastal Gujarat, representatives of trade unions, academia, social activists and civil society organisations deliberated on the ‘ILO Convention on Work in Fishing’ in a state level seminar held in Ahmedabad today (6th May 2008). The participants unanimously demanded the Government of India to immediately ratify the ‘ILO Convention on Work in Fishing, 2007’ and enact a comprehensive legislation, in the light of the ILO Convention, for the benefit of all fishworkers. 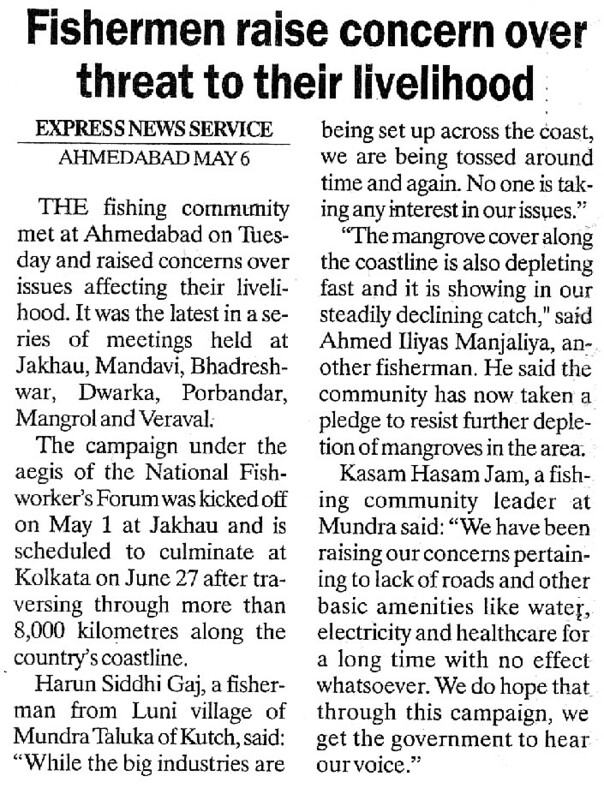 The participants further demanded that the fishing community be consulted in the process. The seminar was jointly organised by NFF, MASS, CEC, ICSF and DISHA in collaboration with the International Labour Organisation (ILO) on the course of the Machhimar Adhikar Rashtriya Abhiyan. The seminar unanimously observed that the responsibility to control and command the natural resources, as common property, vests with the government. That is why it is the responsibility of the government to see that benefits of this common property go to the communities who depend on those for livelihood and not destroyed by other interests. The participants expressed appreciation of ILO’s support and participation in the Seminars on ILO Convention on Work in Fishing Convention and National Legislation for all Fishers. The seminar was presided over by Professor Aswin Karia, Principal, Palanpur Law College. Mr. Sebastian Mathew of ICSF, Mr. J John, Editor, Labour File and Mr. V. Vivekanandan of SIFFS enlightened the seminar through their presentations on the issue. The discussion panel included speakers Mr. Harinesh Pandiya, Smt. Fatima Behn and Smt. Purnima Meher, Shree Narendra Patil further explained and clarified the relevant provisions of the Convention in the context of Indian fisheries. Many fishermen leaders including Umar Bhai, Hassan Bahi,Vijay Bhai and Ismail Bhai presented their perspectives on the convention. Smt. Pankti Jog of JANPATH welcomed the participants to the seminar and Shri Bharat Patel gave the vote of thanks.